I’ll be honest, I felt a little nervous about going to Japan as a family. Our kids are quite young; 3 years and the other turned 9 years whilst we were away. We’ve travelled overseas with them before, but Japan is just so different from anywhere else in the world. How would we all cope? I worried about what they’d eat, both being incredibly fussy eaters; they don’t eat sushi and aren’t particularly fond of plain rice or noodles. I worried about the 10-hour day time flight and what I would do to entertain them for that long. How would the kids deal with culture shock? Particularly Mr.3, who on our last trip to Bali, asked to go home constantly for three days straight!! I questioned how we’d get by with literally no Japanese. What would happen if the kids needed the toilet and we didn’t know how to ask for the nearest loo? I needn’t have worried at all. We did just fine. The kids ate and were far more experimental with their choices. Thanks to the in-flight entertainment the 10-hour flight didn’t seem quite so bad. Thankfully our 3yo only asked to go home twice; and then said he didn’t want to go home when it was time to. Oh, and public toilets are all over the place and easy to get to; we had no near-accidents whatsoever. I must say, organising a walking day tour of Tokyo on the first day turned out to be a huge saving. This helped us get our bearings of the vastness of Tokyo and showed us how to conquer the (incredibly efficient) public transport service. In the following couple of weeks of our adventure, I took note of the surprises our trip to Japan unveiled. Almost every day I took note of something new. I imagine staying longer would unveil even more. You’ll be hard pushed to find a rubbish bin. In Melbourne, we’re so used to throwing our litter away in public bins. In Japan, there are no bins. Well that’s not entirely true, you might be lucky enough to find one in a convenience store (7 Eleven or equivalent) and occasionally on the platform of a main railway station, but not often. There are no bins on the subway, no bins in parks, no bins in public spaces. None. You take your rubbish home with you. This proved to be fun when Mr.3 didn’t want to finish his banana. Smelly times after walking the streets of Tokyo for hours on end. Despite this, you won’t find any stray litter in the streets. Japans streets are clean beyond belief. Mount Fuji is not always capped with snow. Call me naive but I thought Mt. Fuji would be snow-capped year-round. Wrong. We got to see Mt. 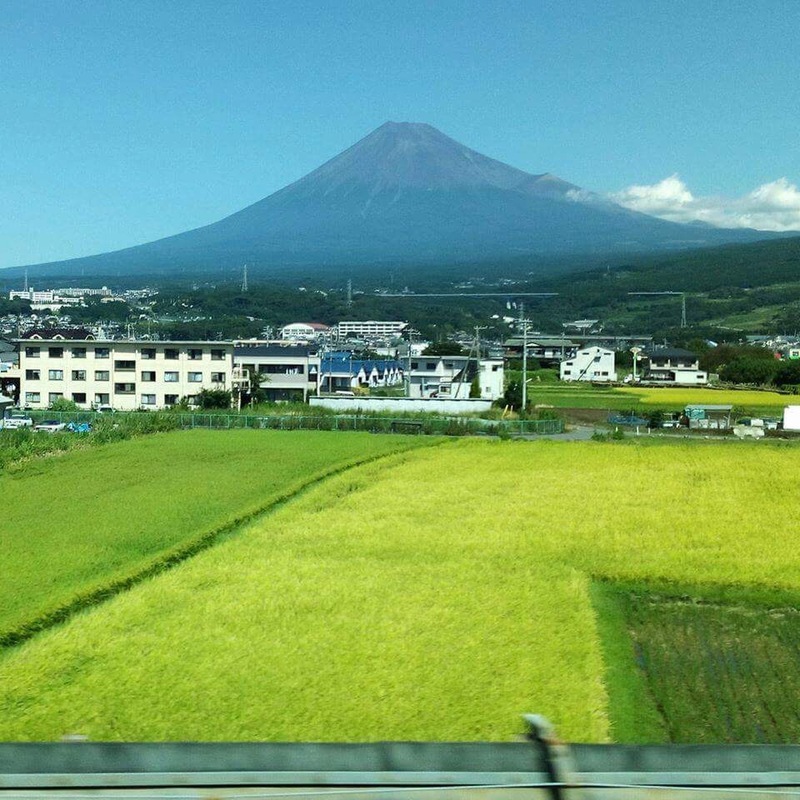 Fuji from the bullet train window when travelling from Tokyo to Kyoto. (Top tip: get a window seat on the right side of the train when travelling to Tokyo. You’ll spot Mt. Fuji after about an hour out of Tokyo, but only for 10 minutes before it’s out of sight again). When travelling in September (Autumn), Mt. Fuji was not snow-capped, but still an incredible sight to see regardless. There are queues for everything. Japanese are incredibly polite, they also love a queue. Dare I say more than us Brits and that’s saying something. It is not uncommon to see queues out of the door of a cafe, restaurant, vending machine, ticket booth or public toilet. We once queued for 45 minutes just to get a frappe from Starbucks. I kid you not. On the subway, passengers wait patiently in file. There are wait lists at popular venues, you must put your name down on the list, if you don’t, you miss out. We learnt the hard way when the kids missed out on the fabulous play area in the National Museum of Nature and Science in Tokyo because we didn’t put our names down when we first arrived. Despite being so busy, Tokyo is quiet. I don’t usually consider my kids to be super loud, but in Japan they seemed like the loudest children in the universe. Japan, Tokyo especially, is densely populated. You’d expect it to be horrendously busy and loud. Busy it is, but loud? Not really. Japanese people are quiet. You’ll notice when walking around the city that many locals are heads down, faces buried in their mobile phones. Families, friends and couples talk quietly to each other. I don’t recall hearing anyone shout during our two week stay. I felt quite embarrassed by the volume of my kid’s voices at times. Yes, it is expensive in Japan but the food is reasonable. Unlike many other Asian countries, Japan is not a cheap destination by any means. That said, it’s the accommodation, travel and main tourist attractions that eat up most of your money. Food is reasonable. If you choose to eat in one of the many eateries off the main streets, you can eat a good meal for a fraction of what you’d otherwise pay. Convenience stores are also excellent for snacks, sandwiches, hot food, sushi and pre-packaged foods. We often bought lunch from a convenience store (they are everywhere) back at our hotel and would eat well for around $20. Occasional English word. I found it funny to hear random English words thrown into conversations or to see an English word in text somewhere. Not a major thing, but funny nonetheless. It also surprised me how many people spoke broken English, even a homeless man (a rare sight) who once asked us for food by saying “hungry’. It’s easy to get by with zero Japanese knowledge, although it’s always worth a try if you do know the odd word or two. There aren’t many birds around in the city. I’m so used to seeing little birds around Melbourne. Pigeons at the train stations, sparrows, Indian Minor birds and seagulls. So much so, I barely notice them. That said, in Japan I couldn’t help but notice the lack of feathered friends. No little sparrows and rarely any pigeons. Pigeons seem so rare in fact, that my eldest son even took photo evidence when he did see one. A Japanese parent pointed to a sole pigeon at the train station, gaining the attention of her smiling son. I can only assume the lack of birds is due to the lack of litter around, as per point no.1. Japanese convenience food is packaged to the max. Japanese convenience food and products are seriously over packaged. Bananas individually wrapped in plastic, little face washers in restaurants given out with chopsticks or cutlery, all individually wrapped in plastic. Biscuits in convenience stores, individually wrapped, sometimes inside another wrapper, and then boxed. Considering litter is at an absolute minimum on the streets and there are hardly any rubbish bins anywhere (as per point no.1) I found this quite contradictory! Japanese TV is absolutely nuts. This isn’t really a huge surprise I know, but when your hotel’s TV is filled with Japanese shows you get to see how cray-cray it really is. My 9yo couldn’t stop laughing at a kid’s morning programme with a TV presenter dressed in a pink cow costume, sitting in a bath with no water. His co-presenter? A talking blue chair. This is just the start, TV shows for adults are just as hilarious. Hours of entertainment right there. There’s a button on the Japanese toilets to give you privacy when you poo. Japanese toilets are so far advanced that I’m surprised the rest of the world hasn’t caught on. With buttons to wash your bum and bits, heat your seat and warm the water, these loos are super tech. The one function that made me giggle the most? The music note button. I thought this might play a tune while you pee. Not so, it’s a button to mimic the flushing of the toilet, without the flush happening. I therefore assume this drowns out the noise if one needs to do a number two without fellow toilet goers noticing. Funny eh? There’s a huge American influence in Japan’s main cities. In Tokyo and Kyoto there are Starbucks and McDonalds all over the place. They are super busy too. What is the most popular spectator sport in Japan? Sumo wrestling you might think. Nope, it’s baseball; a sport most commonly thought of as an American pastime. When strolling around the cities I couldn’t help but notice American clothing shops and stores dedicated to Hawaiian themed goods, too. In travel agent shop windows, I noticed holidays to Hawaii heavily advertised. American influences are alive and well in Japan. Smoking is permitted in restaurants. With the ban of smoking in public spaces in the UK and Australia, I found it quite confronting dealing with smoking in restaurants in Japan. It can be quite uncomfortable eating food with my family whilst a neighbouring table would spark up a ciggie or two. Not a big deal to a local, but to a non-smoker, this can be challenging. What I would say though, is this didn’t happen all the time, only once or twice during our stay. Despite the secondary smoke with our dinner, we absolutely loved our time in Japan. It’s a new favourite destination and I hope you consider the ‘Land of the Rising Sun’ for your next family holiday. Have you travelled to Japan before? If so, what surprised you the most? Erica is a British Expat living in Melbourne, Australia with her two sons, husband and little black rescue cat. She left Hertfordshire for brighter skies and Bayside living, and spends most of her time writing and exploring all the cool things to do with kids in Melbourne and beyond. Follow her Melbourne adventures on her website KidTown Melbourne and catch all the latest Melbourne fun on Facebook and Instagram too!! !